Have you “fallen off the wagon” and gained all the weight back yet again? Are you looking for the one secret that will help you get the weight off once and for all? Well, I don’t think I have exactly what you’re looking for. Whether it’s because of looks or “health”, we live in a culture obsessed with thinness. Our fear of being fat affects everyone – fat people are told that they need to lose weight in any way possible in order to be fully accepted, while thin people are told that they need to avoid becoming fat in any way possible in order to continue to be fully accepted. I started my private practice with a focus on weight management (I mean, that’s what dietitians are supposed to do, right?) and have also worked with many people pre- and post-bariatric surgery over the past 4½ years. It is this experience that has motivated me to move toward a non-diet, Health At Every Size approach, and I want to share some truths about weight loss and dieting that our mainstream, weight-focused culture is not telling you. Imagine if you went to see your doctor because you were sick, and you were prescribed a medication that was proven to only be effective 5-20% of the time and had the side effect of worsening the condition itself – would you still take the medication? This is essentially what is happening when doctors and other health professionals prescribe “lifestyle changes” for weight loss – people lose weight initially (though weight loss “success” in the literature is often less than what many people hope to lose), but over time, most people regain the weight, and often more than they’d lost. To make matters worse, because of weight stigma, often fat/large people are told to lose weight even when that was not what they were at the doctor’s office for in the first place! Even bariatric surgery is not the silver bullet that it was thought to be – procedures like vertical banded gastroplasty (“stomach stapling”) and gastric banding (LapBand or SlimBand) have fallen out of favour due to high risk of complications, inconsistent weight loss and weight regain. As I learned at the recent Canadian Obesity National Summit, even procedures done today result in weight regain over the long-term, not to mention the risks involved. The point is, there is currently no method of weight loss that is 100% safe, effective, reliable and sustainable. While it’s true that weight loss is associated with better health outcomes, and that higher weights are associated with more health issues, the relationship between weight and health is not as direct as most people make it out to be. Numerous studies show improved health outcomes with changes in eating habits, activity, sleep and stress management, regardless of weight. Even in bariatric surgery, there is a phenomenon where some people with type 2 diabetes need significantly less medication within days after their surgery, before any significant weight loss – it is thought that this is due to changes in their gut hormones and/or flora from the surgery itself. More importantly, weight loss is not the sunshine and rainbows that it’s made out to be – when weight is the focus, people live their life by the scale. It pains me to share that working with post-bariatric surgery patients, the most common questions I heard were, “Am I losing weight fast enough?” or “Have I lost enough weight?” Often, health conditions persist or worsen (see: gallstones or kidney stones), and many people don’t look the way they thought they’d look at a certain weight, sparking new body image concerns. 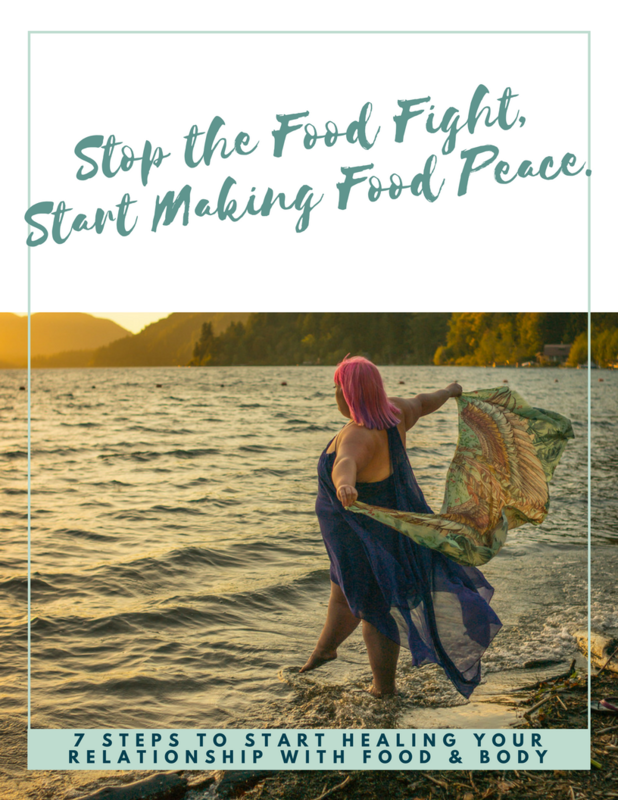 Recently, after listening to an episode of the Fearless Rebelle podcast (appropriately titled “The Body Positivity & Weight Debate“), I got my answer. Fearless Rebelle podcast host Summer Innanen sums it up nicely: “You cannot take down the systems that oppress individuals by upholding them.” In other words, promoting weight loss cannot be body positive because it is upholding a specific body type/size, which in essence continues to oppress individuals who don’t fit the mould. Have you heard these three truths about weight loss and dieting before? What are your thoughts? I hate that 5% number everyone wants to give out about losing weight and keeping it off. To me it sounds like they are try to say “It’s pointless, why even try?” That can be pretty disheartening to people where losing weight might actually help them. I think losing weight, if done in a healthy way with realistic goals, is something to at least try to attain. Eight years ago at 230 lbs I started adding small healthy changes to my life and lost 90 lbs in a 18 months. I have maintained ever since and I have more energy and my self esteem is much better. Hi Charlene, Thanks for your comment and for sharing your weight loss experience. However, that is not the experience that most people have; many people make healthy lifestyle changes and don’t lose any weight at all, while some even gain weight. While weight loss may help some people, there is currently no “healthy” or “realistic” way to achieve this for the vast majority of people, and therefore in my opinion, it is unethical to recommend weight loss as a solution to any problem. Hi Vincci, great blog post as usual. However, I would like to challenge one of your statements ” there are no health conditions that are unique to larger people”. I would argue that lipedema is unique to larger people as it is a disease of the fat tissue. Lipedema is a genetic disease and is not caused by weight gain, they symptoms are certainly worsened with weight gain. People living with lipedema are often misdiagnosed and not recognized as living with a chronic disease. Thanks for your comment, Shelley! I haven’t seen lipedema before and am definitely interested in learning more. Thanks for sharing, Soni, and I’m sorry to hear that you have such a painful condition.